Brother Paul Allen (Washington State University, ‘75) (center), flanked by Brother Mike Flood (Washington State University, ‘72) (left) and Brother Bert Kolde (Washington State University, ‘76) (right) at the WSU Chapter House dedication in 1996. WHEREAS, Paul G. Allen was initiated into the brotherhood of Phi Kappa Theta in 1972 at the Washington Alpha Delta Chapter. WHEREAS, the significance of the fraternity in Brother Allen’s life and his commitment was demonstrated with his leadership in re-chartering the Washington Alpha Delta Chapter in 1993. WHEREAS, in 1996 Brother Allen generously funded the Washington Alpha Delta Chapter House and was actively engaged with the chapter since then, serving as a benefactor and role model. WHEREAS, Brother Allen actively lived the ideals and the motto of Phi Kappa Theta. WHEREAS, Brother Allen co-founded Microsoft, which sparked the microcomputer revolution and later became the world's largest PC software company. WHEREAS, Brother Allen remained a lifelong entrepreneur, being the founder and chairman of Vulcan Inc., which manages his various business and philanthropic efforts. His multibillion-dollar investment portfolio includes technology and media companies and real estate holdings. He owned two professional sports teams, the NFL’s Seattle Seahawks and the NBA’s Portland Trailblazers; he was part-owner of Major League Soccer’s Seattle Sounders FC as well. He also was the founder of the Allen Institute for Brain Science, the Institute for Artificial Intelligence, the Institute for Cell Science and Stratolaunch Systems. 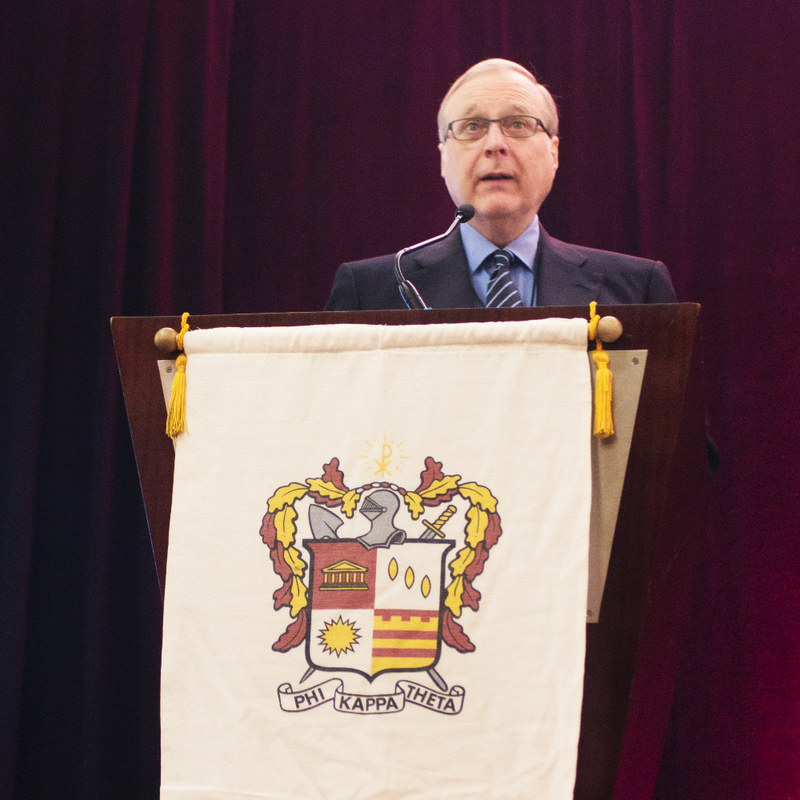 Brother Paul Allen (Washington State University, ‘75) recieving the 2017 Man of Achievement Award at the Phi Kappa Theta Biennial Convention in Washington D.C.. WHEREAS, in 2017 Brother Allen accepted the Phi Kappa Theta Man of Achievement Award. WHEREAS, Phi Kappa Theta Fraternity and Phi Kappa Theta Foundation feel a profound loss with Brother Paul Allen joining our Chapter Eternal. THEREFORE, BE IT RESOLVED that the Foundation and Fraternity extend their deepest sympathy to Brother Allen’s family, friends and colleagues and let them know that the Brothers of Phi Kappa Theta will forever look to him as a role model for the Fraternity’s ideals and motto — Give, Expecting Nothing Thereof — and have his family, friends and colleagues in their thoughts and prayers. Folks—a moment of your time to reflect upon the upcoming Veterans day observance. First a bit of history, World War I officially ended on June 28, 1919, with the signing of the Treaty of Versailles. The actual fighting between the Allies and Germany, however, ended seven months earlier with the armistice, which went into effect on the eleventh hour of the eleventh day of the eleventh month in 1918. Armistice Day, as November 11 became known, officially became a holiday in the United States in 1926, and a national holiday 12 years later. On June 1, 1954, the name was changed to Veterans Day to honor all U.S. veterans. In 1968, new legislation changed the national commemoration of Veterans Day to the fourth Monday in October. Tomb of the Unknown Soldier. Arlington Cemetery, (Fort Myer, VA) Washington D.C.. It soon became apparent, however, that November 11 was a date of historic significance to many Americans. Therefore, in 1978 Congress returned the observance to its traditional date. Tomb of the Unknowns—Official, national ceremonies for Veterans Day center around the Tomb of the Unknowns. To honor these unknown Veterans, symbolic of all Americans who gave their lives in all wars, an Army honor guard, the 3d U.S. Infantry (The Old Guard), keeps day and night vigil. At 11 a.m. on November 11, a combined color guard representing all military services executes "Present Arms" at the tomb. The nation's tribute to its war dead is symbolized by the laying of a presidential wreath and the playing of "Taps." There are approximately 18.8 million military veterans living in the United States. Source: U.S. Census Bureau. 4 Million served in peacetime. The Persian Gulf War, Afghanistan, Iraq – 5.6 Million military veterans living. Please take a moment to reflect upon all Soldiers, Sailors, Marines, Airmen and others whose service ensured our Nation's safety. Brother Van Poots and his wife, Holly, at the Navy Ball. Thanks for taking a few moments out of your day to reflect upon those who are serving or have served in defense of our country. My service as a veteran in the US Navy and my membership in Phi Kappa Theta started in college 27 years ago & continues to this day. Phi Kappa Theta fosters human development through community service and social interaction. We are socially engaged, recognizing our responsibility to affect positive change in ourselves and others. Phi Kappa Theta’s values are demonstrated through the actions of our members, who better their communities as citizens in a global society. Main image: Reed & Ryan Van Poots, sons of Brother Van Poots, saying goodby to him next to his sea bag on Mobilization day. Ad for the Mike Callais campaign. When my family sold all of our offshore supply vessels in 2013, I was fortunate to be able to go into semi-retirement. I was able to have more flexibility in my daily schedule for other pursuits. I was able to spend more time with my wife, Blanche, my children, grandchildren and mother. I also had more time to devote to work in the service organizations to which I belong, as well as to church and to my community. A friend who I went to high school with and who happens to be a Phi Kappa Theta brother from Nicholls State University by the name of John Melancon, serves as an elected Commissioner of the Greater Lafourche Port Commission. Last May, he told me that one of the Commissioners had passed away, and he knew that with my background I could possibly be appointed to serve in the interim until a special election to fill the remainder of the term could be held. I agreed and was appointed to that position, but I never thought that I might want to seek an elected position on the board myself. I enjoyed my time of service on the Port Commission board until the newly elected replacement Commissioner took his seat on the board. I felt that I was able to contribute to the administration of Port Fourchon and the South Lafourche Airport. Although I had never planned to seek elected office, I started to consider running for a Seat of my own when all of the seats came up for a vote this year. I decided in February of 2018 that I would run for Seat H on the Port Commission after I found out that the man who was holding that seat would not seek reelection. I started campaigning for the position. I put out signs on the highway, did newspaper advertising and started a campaign Facebook page. I was hoping that no one would qualify to run against me. When qualifying for the November 6th election came up on July 25th, I was the first in line at the Clerk of Court’s office to qualify. No one else qualified for that seat for the remainder of that day. I was hopeful that no one else would qualify to run for that Seat. Mid-morning on the second day of qualifying, a gentleman qualified to run against me. I had never met my opponent previously, in fact I had never even heard of him. I was disappointed that someone had qualified to run against me, but I took consolation in the fact that I had only one opponent in the race so it would be decided in the primary election. Brother Mike Callais (Louisiana State University, ‘84) with wife, Blanche. Up until that point my wife and I had been handling all of the promotion of my campaign. I contracted out for a telephone poll to be conducted in my race two months before the election. The poll results indicated that I had only a 4% lead against my opponent. In addition to that, some of the people I know told me they thought it would be a close race. I believed that I was better qualified than my opponent so I decided that I needed the help of a consultant to help me get my name and message out. I had two obstacles I had to overcome. First, I had decided to use my legal first name on the ballot so it would read Charles “Mike” Callais rather than simply as Mike Callais as most people knew me. Secondly, I had decided to qualify on the ballot as “No Party” rather than as a member of a party. I put more signs out, started doing more newspaper advertising, did radio advertising, fair and festival sponsorships, auction item donations, increased my Facebook promotions with a video done for me and appeared at public events to talk to people and introduce myself. I finished out the campaign with a direct mail piece. I truly felt that the momentum of my campaign was building and that my opponent wasn’t working as hard as I was, but I wasn’t certain that I would be successful. On election night I didn’t want to have a big victory party, so I invited only my immediate family to watch the election results with me. When the results came in I ended up with a 16% lead over my opponent. I was able to relax and thank my family for supporting me in this effort. I am now going around thanking my supporters and telling everyone that I am looking forward to serving them in this position and offering my help if it is needed. View my campaign Facebook page at facebook.com/MikeCallaisPortCommission and my personal Facebook page at facebook.com/mike.callais. Charles “Mike” Callais (Louisiana State University, ’84) is a member of the Phi Kappa Theta Foundation Board of Trustees, serving a term from 2017 to 2020. He graduated from Louisiana State University in Baton Rouge in 1984, earing a bachelor of science degree in business management. He is Chief Executive Officer of Abdon Callais Offshore, LLC in Cut Off, Louisiana. Mike is active in the Knights of Columbus and the Rotary Club of Golden Meadow. 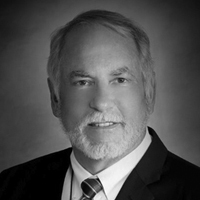 He also serves on several boards, including United Community Bank, the Greater Lafourche Port Commission, Lady of the Sea General Hospital and Catholic Charities of the Diocese of Houma-Thibodaux. Mr. Callais is married to Blanche Bouvier Callais, with four children and four grandchildren. He resides in Cut Off, LA. His hobbies include fishing and hunting, volunteering and helping out at his church parish and in his community.